In recent years, the prokaryotic CRISPR-Cas systems have been repurposed for a wide range of genome editing and gene expression control applications. CRISPR-based genome engineering is poised to become a transformative technology in synthetic biology, biotechnology and molecular medicine. The genome editing technology relies on RNA-guided DNA nuclease enzymes such as Cas9. Our pioneering work in this field identified the biochemical activity of Cas9 and shed light on its molecular mechanism. In our future studies, we will aim to obtain further mechanistic insights into CRISPR-associated nucleases and use structure-based protein engineering approaches as well as cellular delivery methodologies based on in vitro reconstituted ribonucleoprotein complexes to address current limitations of CRISPR-Cas genome editing and enhance its capabilities. These studies will help improve the efficacy, versatility and specificity of the technology, thereby augmenting its potential for applications in human gene therapies. Martin Jinek is a Tenure-Track Assistant Professor in the Department of Biochemistry at the University of Zurich, Switzerland. His research is focused on protein-RNA interactions and macromolecular complexes involved in post-transcriptional regulation of gene expression or in genome defense pathways such as CRISPR-Cas. In his studies, Dr Jinek uses biochemical and structural approaches to investigate these processes at the atomic level. Originally from the Czech Republic, Martin Jinek studied Natural Sciences at the University of Cambridge (UK). In 2006, he received his PhD from the European Molecular Biology Laboratory (EMBL) in Heidelberg, Germany, where he carried out his doctoral research in the laboratory of Professor Elena Conti. He then moved to the University of California at Berkeley for postdoctoral research with Professor Jennifer Doudna, where his work made fundamental contributions towards developing the CRISPR-Cas9 system into a powerful genome editing technology. In 2013, Dr Jinek set up his independent research group in Zurich and was awarded a European Research Council (ERC) Starting Grant. 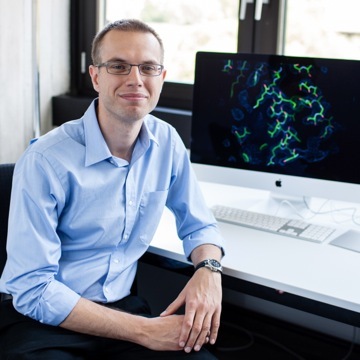 In further recognition of his work, Martin Jinek has received the EMBL John Kendrew Young Scientist Award (2014) and the Friedrich Miescher Award of the Swiss Society for Molecular and Cellular Biosciences (2015).